During the Open Geneva Innovation Festival 2018 a group of Pangloss members and others assembled to think about how to introduce hydrogen as a clean energy vector in our society. Various ideas were aired. A condensation took place for the Fête de la Science in Ferney-Voltaire half a year later. One of the concepts put forward was that of bringing hydrogen bicycles to the people. Two workshops (hackathons) on the subject followed in January and March 2019. The hydrogen powered electric bicycle (HPEB) is not a new idea. Already 20 years ago such vehicles were constructed, but they were never made available to the common person, not to talk about production in series. The latest version, the Alpha bike of French company Pragma Industries is produced in batches of a hundred units and distributed to users, usually organizations, who can afford the rather hefty price of the bicycle of the order of 7'000 euros and the massive cost of a refilling station upwards of 50'000 euros. At Pangloss Labs we have the idea to make all this cheaper with the goal to enable everybody profitting from green energy and clean hydrogen thus making a measurable contribution to a more sustainable world. 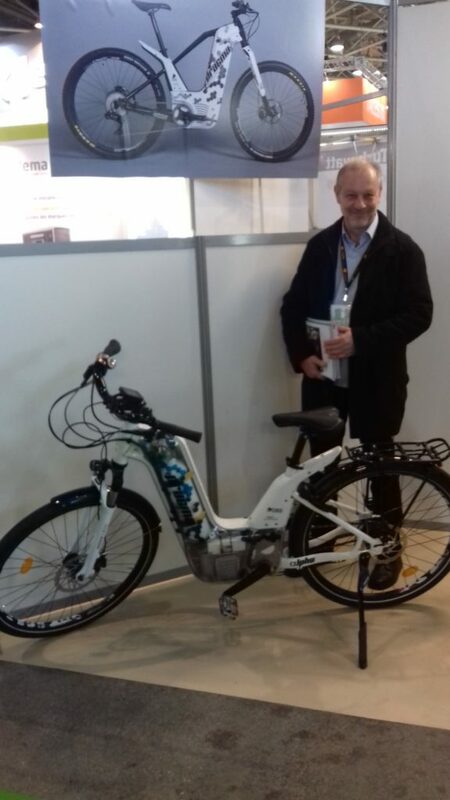 Harald, a member of Pangloss Labs next to the Alpha hydrogen bike of Pragma Industries at BePositive Expo Lyon 2019. Our concept turns around the creation of a kit for converting normal bicycles into hydrogen powered electric bicycles (HPEB). Such kits should be cheap. The HPEB should not cost more than the equivalent electric bike but - and this will be the major advantage for the cyclist - with much larger autonomy. We think that eventually we can store 50 grams of hydrogen on the bike, which is equivalent to 750 Wh using a decent fuelcell, 50% more energy than typically stored on an electric bicycle. Bigger hydrogen containers and more efficient fuel cells will soon bring the advantage to 100% doubling the autonomy. 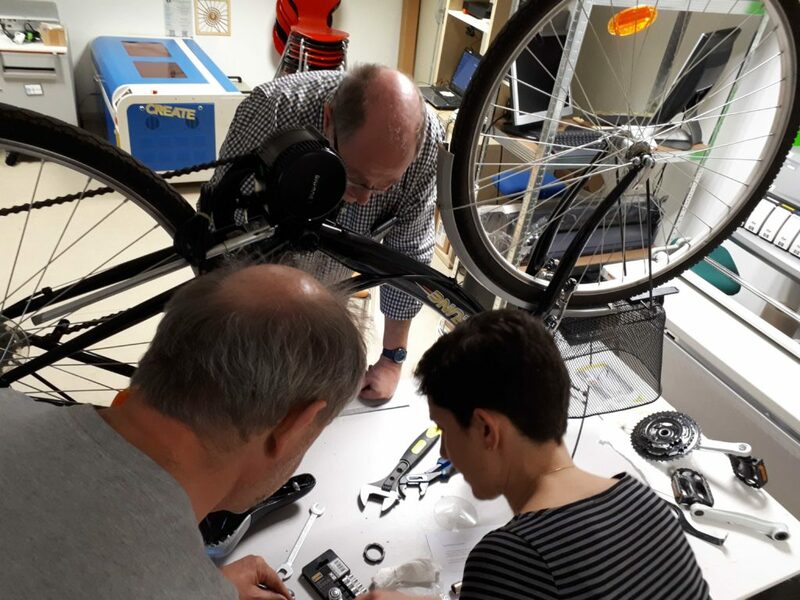 The crew in the Pangloss FabLab at Ferney-Voltaire on their way installing the electric motor and other components on the bike on 23 March 2019.